In Separate and Unequal in 1963, students are asked to place themselves in 1963 Birmingham, Alabama to deliberate together through the difficult choices faced by those working to address segregation and inequality. it's the Alabama you make. Our Community, Our Future: The Role of Citizens in Solving the High School Dropout Situation. 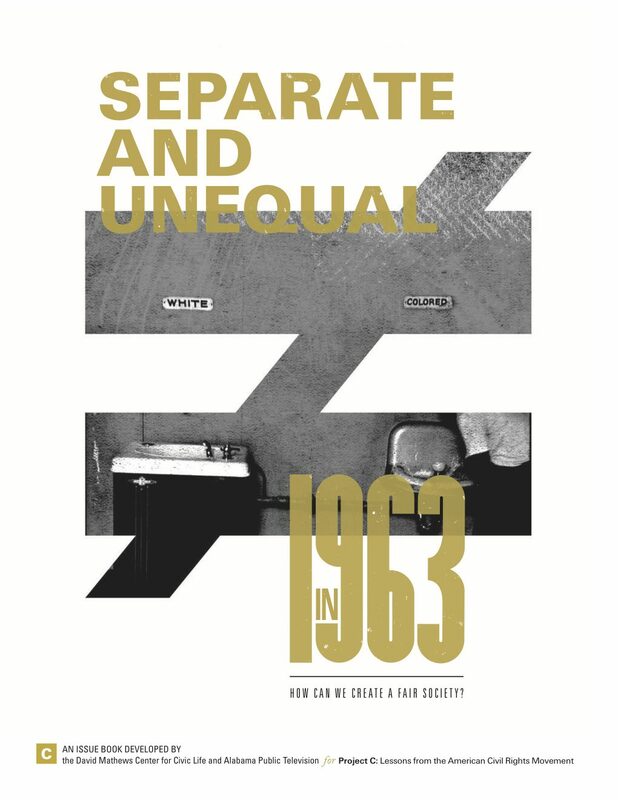 Separate and Unequal in 1963: How Can We Create a Fair Society? is a 22-page historical issue guide developed in 2014 by the David Mathews Center for Civic Life, Alabama Public Television (APT), and additional partners for use in a classroom setting. In preparation for the David Mathews Center’s 2018 professional development series for educators, sponsored by the Alabama Bicentennial Commission, we have been expanding and revamping our free resources available to teachers. 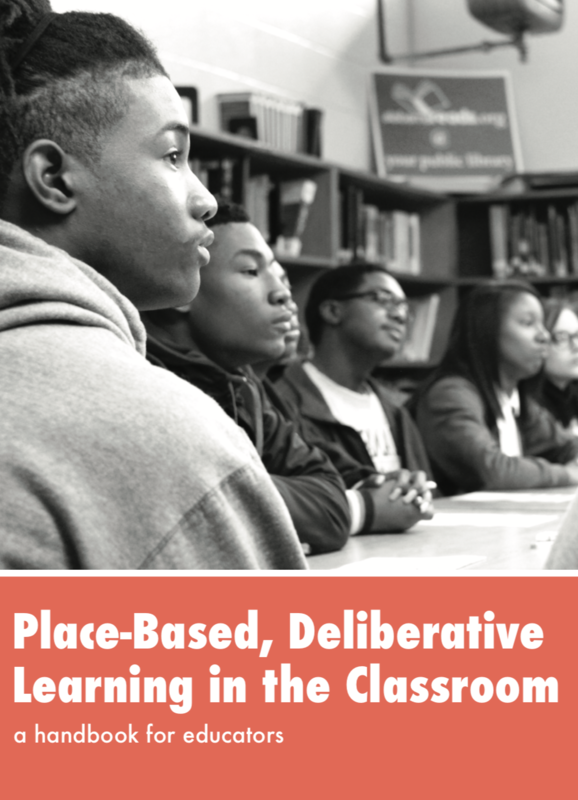 Included in our expanded resources offering is the corresponding handbook to this year’s workshop series: Place-Based, Deliberative Learning in the Classroom. 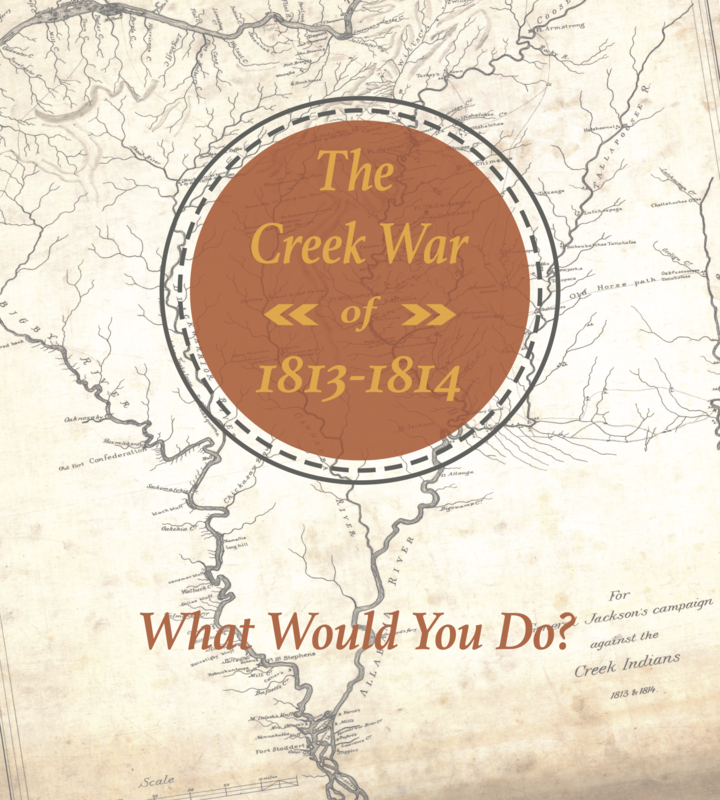 The David Mathews Center, in partnership with Auburn University’s Caroline Marshall Draughon Center for the Arts and Humanities and the Clarke County Historical Society has recently published a new historic issue guide: The Creek War of 1813 – 1814. 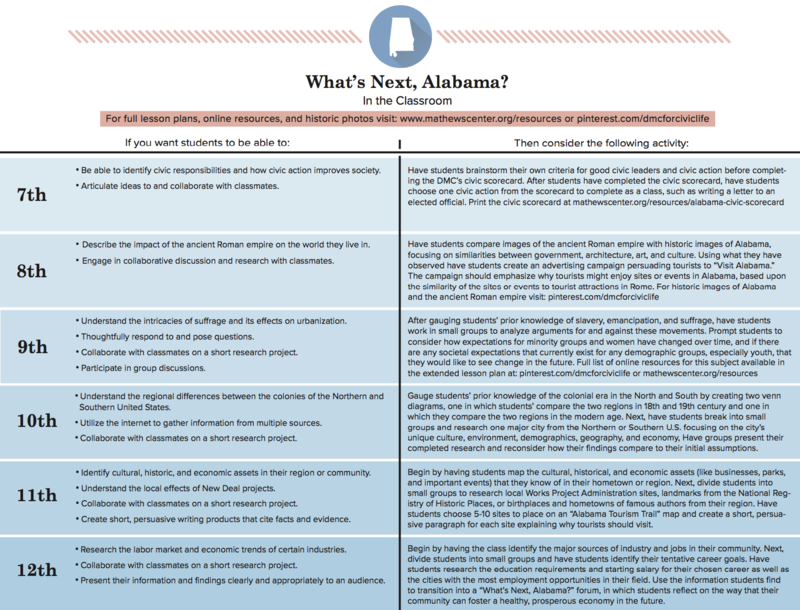 This standards-aligned guide is the key to incorporating “What’s Next, Alabama?” deliberative discussions into your class. The guide offers activities for grades 7-12 which align with state standards. The deliberative process moves students gradually from acquiring a basic understanding of an issue to thinking critically about plans to address it, and eventually revising, combining, and building upon many ideas to find common ground to approaches. 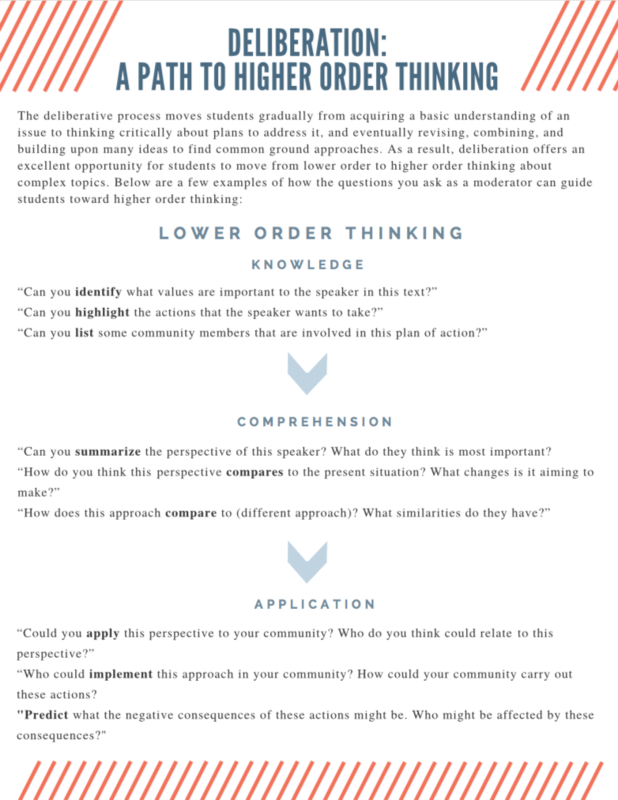 This guide offers a few examples of how questions you ask as a moderator can guide students toward higher order thinking. 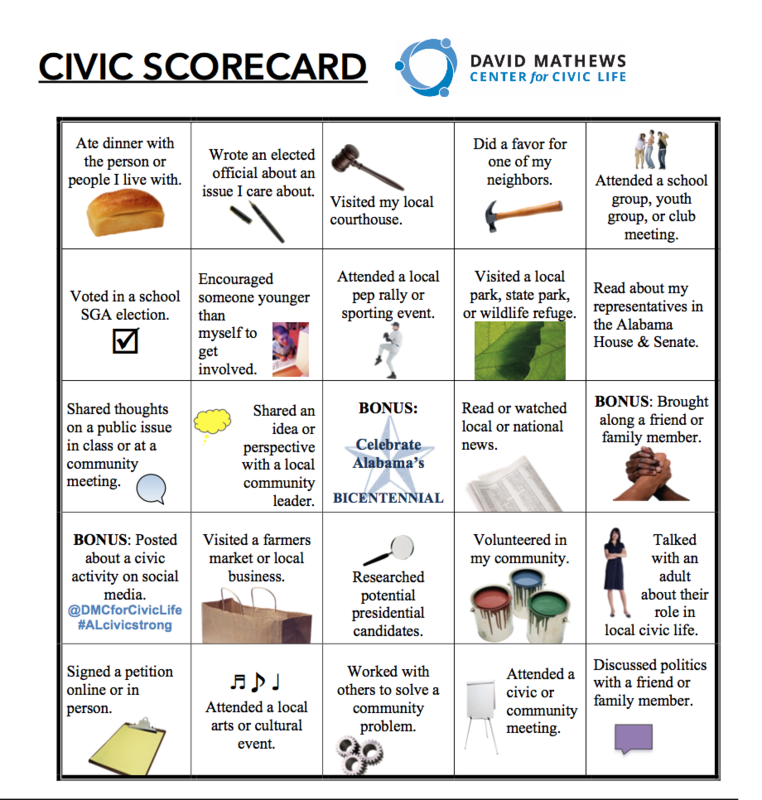 The Alabama Civic Scorecard, inspired by data from the 2015 Alabama Civic Health Index, is a tool for engaging young people in local, state, and national civic life. The Scorecard encourages increased youth involvement in political action, social connectedness, and public work. Educators and parents are invited to download and use the Scorecard free of charge. We also grant permission for adaptation, with acknowledgment, to accommodate educational objectives and local contexts. Those who share or send their completed and signed Civic Scorecard to DMC will receive a Certificate of Civic Engagement. 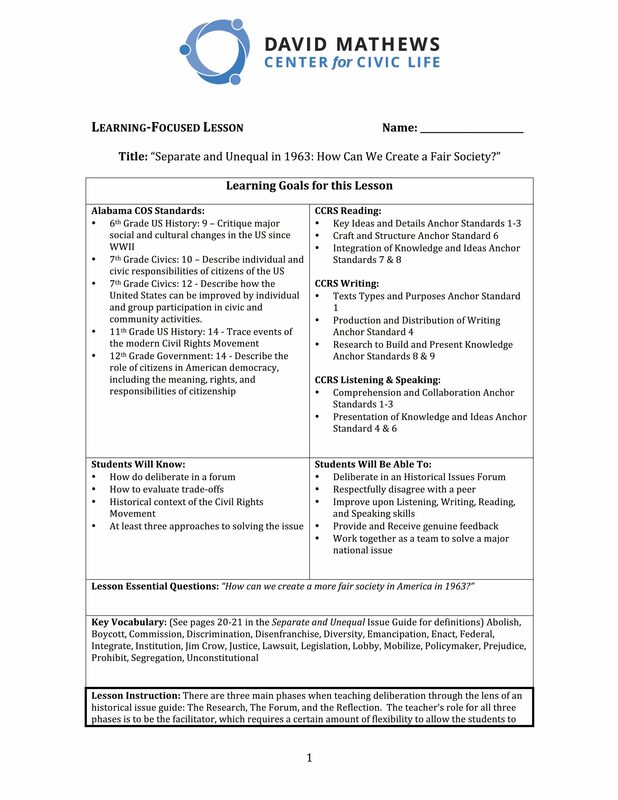 Lesson Plan: Separate and Unequal in 1963: How Do We Create a Fair Society? 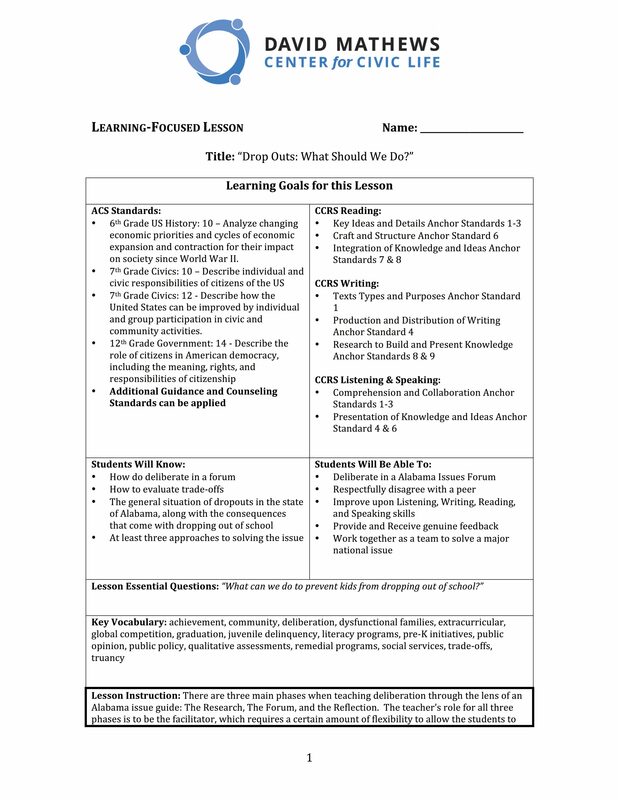 This lesson plan serves as a companion to the Project C issue guide; it lays out a lesson plan — which is up to the latest standards–for exploring this issue in the classroom and having a deliberative conversation with students. This lesson plan was developed in partnership with JohnMark Edwards of Birmingham’s Phillips Academy. Lesson Plan: Bullying: How Do We Prevent It? This lesson plan serves as a companion to the Bullying issue guide; it lays out a lesson plan — which is up to the latest standards–for exploring this issue in the classroom and having a deliberative conversation with students. This lesson plan was developed in partnership with JohnMark Edwards of Birmingham’s Phillips Academy. Lesson Plan: Dropouts: What Should We Do?